What is My Historical Collectible Worth? 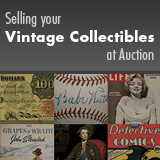 Search and browse through millions of auction archives to determine demand and value. Our experts will evaluate your Historical Collectibles for auction or private treaty sale. What is the Historical Category? Is My Historical Memorabilia Valuable? What Historical Collectibles Does Heritage Auctions Handle? How Do I Get My Historical Collection Appraised? As you may have noticed, we have recently changed the title of our department from Americana to Historical. Formerly, our focus was on collectibles that reflected the growth and character of the American culture; we specialized primarily in political campaign memorabilia, autographs, and manuscripts. In the last year, we have expanded our horizons dramatically with the addition or expansion of several exciting collecting areas including rare books, space, photography, and natural history. This has necessitated the broadening of our department's title to something more descriptive of what we are really all about. The word "historical" can be defined as simply "important in history." Fundamentally, we offer collectibles and memorabilia that have shaped or changed our world and our culture, items that relate to those individuals, groups, causes, or inventions that have influenced our history. Taking a look at the category links in the box to the left will give you an idea of the scope of our current and future offerings of which "Americana" is just a small (but important) part. From minerals and fossils dug from the depths of the earth to flags and medals that have actually been to the surface of the moon. From stone American Indian war clubs to jewel-encrusted swords presented to Civil War heroes. From pages printed by Gutenberg to the finest rare modern limited editions. Heritage Auctions' Historical Department is your source for all of this and much more. The "Antiques and Collectibles" section of your local or online bookstore can serve as a good place to find basic information. However, printed material, although good as a general guide, is often out of date. The best way to find out what Americana items are worth is to look at what collectors are actually paying for it. Heritage's Auction Archives show actual prices paid in our auctions for many fine Historical collectibles, and more prices are being added all the time. With every individual item lot imaged, the Permanent Auction Archives are also an outstanding resource for identifying your material. This is a free resource, available to all Heritage members. Sign up now!! Air and Space collectibles including original material the early days of aviation and quality original space memorabilia. Lithographs that are badly stained, torn, or have pieces missing. Pinback buttons that are cracked, defaced, or stained. Jim Beam or Avon bottles or any modern "Limited Edition." The first step in getting an accurate appraisal is to have the items assessed by a professional. Heritage has been serving the collectibles community for over three decades. During that time we have grown to become the world's largest collectibles dealer by staying on the cutting edge of technology, emphasizing great communications and, above all, listening to what our customers want and then giving them a fair deal on their material. With the agreement of your Heritage representative, Heritage can provide insurance on overnight delivery for your package. Contact us today to discuss a free auction evaluation. For a formal written appraisal for estate planning, insurance, or tax purposes, please contact our Appraisal Services Department. Charges for formal written appraisals are based on our experts' time. Appraisal fee schedule can be viewed here. Collecting has always been in Tom Slater’s blood. At the age of six he began with sea shells, and soon graduated to coins, the “gateway drug” to so many other fields of collecting. By the age of ten, Tom’s Dad would drop him off at coin shows within driving range, picking him up at the end of the day. All the dealers knew Tom, and they would give him coins to shop around the floor with the hope of making a small commission. Usually he was able to make $50 to $100, no small sum in the early 1960s, which of course was promptly invested in his collection. When Tom was 12 he rented space in his barber’s shop and set up a display case, selling coins on weekends. A year later he formed a partnership with one of his customers, and the pair opened their own coin shop. When Tom eventually left for college his partner continued to operate the shop for some 20 years. But the turning point in Tom’s collecting journey came when as a high school student he by chance discovered the then-infant hobby of political campaign collectibles. An avid reader of anything to do with U.S. history, especially that of the presidents, he was instantly hooked! Tom published his first political memorabilia sales list at age 19, and founded a major mail order auction at 25. Somehow he managed to find time to graduate from Yale with honors, and brief experiments with law school and a corporate sales position were but minor detours. In 1976 he became a full-time dealer and auctioneer, and maintained a robust business in political and other collectors’ items until his company, Slater’s Americana, was absorbed by Heritage in 2004. Since that time Tom has served as Director of Americana auctions and Senior Historical Specialist for Heritage Auctions.